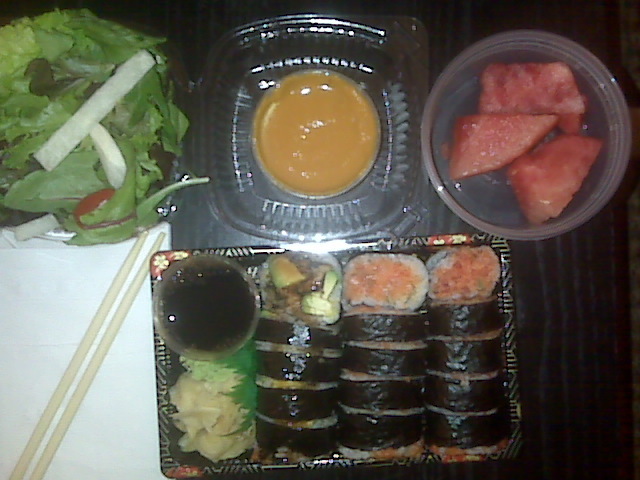 I ordered in from Wasabi Lobby last night on the recommendation of a friend who loves it. Well, sorry friend but really? When I opened the bag up, I was very optimistic, a few nice findings included a salad that actually had mesclun lettuce and some jicama instead of the normal iceberg pathetic-ness that most sushi places serve. I was also pleasantly surprised to find some watermelon included free of charge. Nice touch Wasabi Lobby! Other than that, wow, it was pretty bad. Some people might like overstuffed rolls, but for me, they were just ridiculous. Two full bites from each one, and a total mess. The spicy salmon and tuna were mushed up instead of chopped the way they should be, and this resulted in a squishy, unappealing presentation. The texture was a lot like uni, the one sushi item that I don’t like because of its consistency. The quality of the fish was poor. I couldn’t finish my dinner, which is shocking since I can pretty much eat my weight in sushi…but that’s only when it actually tastes good. Sorry Wasabi Lobby, your attractive looks were deceiving. As a friend of mine would say, good from afar, but far from good. >Not one of my favorites, but usually I at least find the food edible if not good.